PVAC posted a CODE RED as both locations are at capacity. These pets have been previously networked and are past their deadline for pickup by adopters, fosters, or rescues. ADOPTERS: If you are interested in adopting, you MUST be at Palm Valley Animal Center building #1 at 8AM tomorrow morning (9/26). 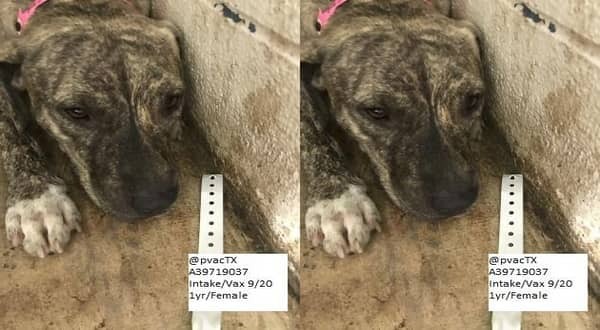 RESCUE ORGS: If you are interested in tagging a pet, you MUST email urgent@pvactx.org before 8AM tomorrow with the pet ID #A39719037. FOSTERS: If you are interested in fostering, please sign up at pvaconline.com/foster before 8AM tomorrow with the ID number A39719037 of the pet you are interested in. 3 Responses to "Will it hurt to go to heaven? this pup is now sitting in the back room smelling death"
can she be adopted from Minnesota?